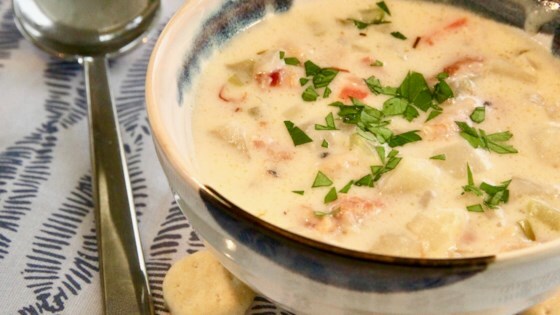 "Delicious and creamy clam chowder includes carrots, celery, thyme, and a hint of bacon." Heat a large soup pan over medium heat. Add bacon and cook until crispy, 5 to 7 minutes. Add butter, potatoes, celery, carrots, onion, salt, and black pepper. Reduce heat to low. Cook and stir 10 minutes. Sprinkle in flour and stir 1 minute. Add milk, clam juice, clams, lemon juice, thyme, cayenne pepper, garlic salt, and onion powder. Simmer on low until potatoes are tender, 20 to 25 minutes. Add cream and simmer 5 minutes more. To thicken chowder if necessary, combine cornstarch and water together in a bowl. Add cornstarch mixture to chowder and stir until incorporated and chowder is thickened. Feel free to use turkey bacon if you prefer. Added more clams than call for. Everyone thought the soup was outstanding. This is an excellent clam chowder. Even my daughter who doesn't like clam chowder enjoyed it. I forgot to add the cream at the end, but it was still great. I will make this again. This recipe hit my taste buds just right. Will now make this recipe again and again. I only cook for one, so, sadly, it doesn't matter what anyone else thinks.